Our CEO Helen Chaloner and Chair Heather Soderlind are joining our friends The Charles Causley Trust to mark 100 years since the birth of the celebrated and much loved Cornish poet in his hometown, Launceston today. 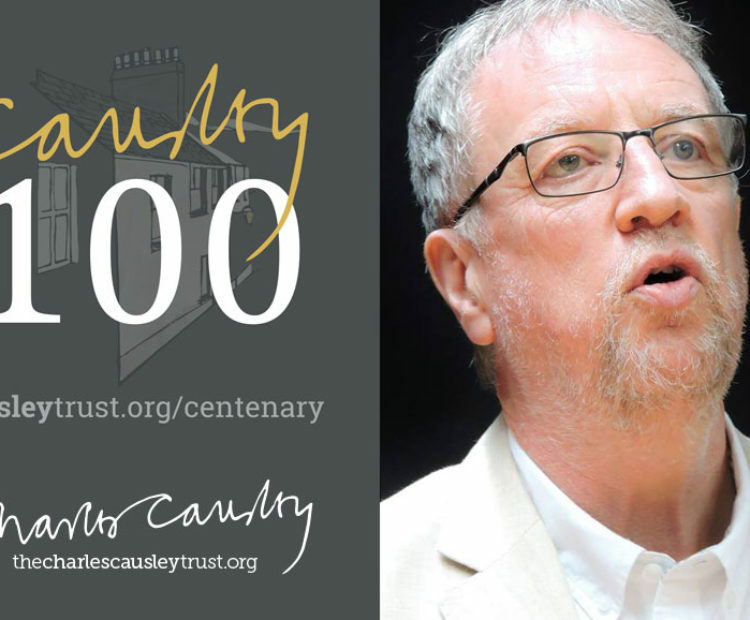 To celebrate the centenary, we're delighted to share Causley 100 Writer-in-Residence Cahal Dallat's final blog post which aptly explores the relationship between poetry and place. “Not so much putting poetry in its place, or keeping poetry in its place, but speculating, at the end of a poetry ‘placement’ in what has become, over the months, one dear perpetual place (to quote WB Yeats) on the possible interconnectedness of inspiration and location, location, location. Living in Cyprus Well, being ‘placed’ in Charles Causley’s house, has been a rural experience in itself, watching spring set off her green fuses on the overgrown steeps of Ridgegrove Hill, so that burgeoning banks and hedgerows, trim when I arrived in April, have, by August, seriously narrowed the road to the old mill and the richly wooded Kensey Valley. A season in such natural surroundings should be enough to inspire any poet: a lifetime, as Charles had, 85 years of wandering these woods and waters could, you might think, make a John Clare or a Wordsworth of any of us. Clare’s influence is clear from one of Charles’ early poems, ‘At the Grave of John Clare’, from a visit in his teacher-training year in Peterborough: and yet in that bracketing, above, of Causley, Clare and Wordsworth, it occurs to me that all three have something in common that not all poets-of-place, all of those we think of as ‘local poets’, do have. John Hewitt, the ‘local poet’ in the Glens of Antrim where I grew up, is an instructive counter-example. A Belfastman who made the rural, time-locked Glens his ‘chosen place’, Hewitt was to graduate from poems in praise of landscsape, to understanding and advocating an older, simpler way of life. And to reassessing the value of tradition, craft, and lore, just as poets, song collectors, industrial archaeologists, and working-class historians did all over these islands in the mid-20c. Cornwall too, like the Glens, can claim outsiderness from the bucolic ease Hewitt attributes here to Constable’s Suffolk, or Clare’s Northamptonshire. Yet Hewitt, espousing a terrain of hill farms and deep-groined Glens, is himself no countryman. John Clare knew his locale’s wildlife and farm practices, and got much closer to the owl or the ladybird or the fabled last sheaf, than did townsman John Hewitt, a political poet discovering ‘nature’ as an adult; than did Hewitt the well-meaning city-type, ever willing to lend a hand at harvest, but knowing, as his farming neighbours knew, that he lacked the ease of those born and bred to the rhythm of work. So I’m finding myself reluctantly dividing my favourite ‘local poets’ into those who are ‘of’, and born into, a particular place and those who adopt rural felicity, perhaps for poetic purposes, of whom there are quite a few. Gerard Manley Hopkins, born in London’s Stratford-by-Bow was to become a transformative nature-writer. As for WB Yeats, no-one could have been more wedded to the tug of West-of-Ireland rural life than the Dublin-born, London-raised boy who spent idyllic, free-rein summers at his Sligo grandparents’. Yet Yeats never gets quite as close to the ladybird as John Clare does. (Or knows to call it a clock-o’-clay.) True, Yeats lies down where all the ladders start, in some metaphorical rag-and-bone shop, but does he ever lie down among the cowparsley, or wild garlic or bog cotton? City-born US nature poet Robinson Jeffers sought out the wildest part of America’s West Coast and built a stone house in which his wife and children would live a 1920s back-to-nature ‘good-life’, spinning and baking and reading Hardy’s tragedies by candlelight. In his struggle for rural authenticity he went as far as learning the craft of English Elizabethan barn building from an Irish stonemason and rolled the individual stones up from the beach. Just as he built his controversial Greek-tragedy-style narrative poems from local materials such as the people and rocky landscape of that very specific chosen place. But he was still an ‘incomer’. In his search for the craggy isolation Jeffers came to live in the Antrim Glens at Cushendun (which city-born, public-school-educated Irish poet Louis MacNeice writes of, lovingly) and decided that if the Big Sur coast with all it’s wildness wasn’t already his chosen ‘sublime’, Fair Head’s preciptitous basalt cliff, between Cushendun and Ballycastle would have been ‘heaven’. Cornwall impressed him almost as much as North Antrim, but he found the rest of England muddy and disappointing! The topography of Cornwall’s rocky coast, like Antrim’s, is, of course (and Cornish filmgoers will know this without ever having been to Carmel) remarkably similar to the wild coves of Point Lobos by the Jefferses’ Californian home which Alfred Hitchcock used as ‘instant Cornwall’ in ‘Rebecca’. John Hewitt, in the 1940s’ was influenced by Robinson Jeffers’ 1920s ‘Glens’ poems. And a young Seamus Heaney, reading Hewitt’s poetry in the local town library in the 1950s, was liberated into realising he could write about local places and local lives, even though the places Hewitt was writing about were all of 30 miles away. So Heaney, (from Mossbawn) brought up on a farm, was as familiar, as a child, with frogspawn and blackberries and messing about in rivers and meadows, as would have been, say, Wordsworth (Cockermouth), Coleridge (Ottery St Mary), John Clare (Helpston), Thomas Hardy (Higher Bockhampton), Patrick Kavanagh (Iniskeen) and Ted Hughes (Mytholmroyd). And yet Heaney might never have been a poet if it were not for poet-incomers, city-dwellers-gone-native like Jeffers in Carmel, Hewitt in the Antrim Glens, not to mention the ruralist example of the Dymock poets – Edward Thomas, Rupert Brooke, Robert Frost, John Drinkwater and Eleanor Farjeon, all city-born – hanging round the Old Nailshop and drinking rough cider in Gloucestershire. Not that there’s the slightest suggestion that either side, country-born poets or city-born adopters, are better at describing nature and country life. Only that one can see they offer two strikingly different — and complementary perspectives. Charles Causley was, strictly speaking, a ‘town’ boy, born in the town’s-egde hamlet of St Thomas, or Newport, at the bottom of Launceston’s Castle Hill. But the river ran past his door, a shallow trickle at that point, the river, one imagines, that reappears in Eden Rock, last poem in his ‘Collected’, last poem he read for recording purposes, and the poem that, according to local sources, recalls, in some mystical future as it were, a long-distant family day in the River Kensey’s meadows upriver from his Newport riverside home. Cross the (not so new) new bridge, a few yards to the right, and you’re back in the open country of the Kensey Valley. Charles’s mother moved twice, but within a short distance on both occasions, and even when Charles came back from naval service in World War II, having seen Belfast, Freetown, Gibraltar and Sydney, their next move was to Ridgegrove Hill on Launceston’s southern edge, richly, verdantly rural despite being within a short walk of (now) Chinese takeaway, hardware store, home brew suppliers and the bakery that smells of tomorrow’s loaves at eleven-thirty at night. Even after the move Charles was still only a short stroll from his old home and the school where he taught, looking out daily over the willow gardens, the slate roofs of Riverside where he’d been born, and cabbages in the local allotments, all of which conjure up the sense of ‘place’ in his poems. Not that Charles is ever ‘just’ a nature poet, though that might be vocation enough, ever just a poet of rural life, of tradition, inheritance, local lore and as intimate knowledge of a townspeople’s complex relationships, as Thomas Hardy had of his locale. When Charles wrote and presented a TV documentary on fellow-West-Country poet, Hardy, he called it ‘a man who noticed things’. And like Hardy, Charles was a man who had noticed things about Launceston and Newport, about the Kensey and its long fertile valley, about the ordinary people who lived in the streets around him. And almost uniquely for a poet in his generation, Charles was, to use Hardy’s line about his own father, ‘a man who lived and died in the place where he was born’. I salute you with tears. The river beside Causley’s first childhood home and the church at which he is buried. In the same poem Charles quotes the epitaph from John Clare’s grave in Helpston, ‘A Poet is Born, Not Made’: which we might be tempted to recast, with apologies to all well-intentioned, enthusiastic, nature-loving incomers, as ‘a local poet is born, not made’. Does something special come from the fact of Charles’ living and dying ‘in the place where he was born’? Arguably the extent to which the details of place, of childhood memories, of the area’s natural life, all infuse the poems with authenticity. Arguably the extent to which his narrative poems and character poems, about real, fictional, historic, legendary and religious figures, draw on the region’s sources – though his myths aren’t solely local, and his travels take on the entire globe in later years. But perhaps the something special isn’t in how much ‘place’ is in ‘poems’. For me the ‘something special’ isn’t simply in the poems but in how Charles and his poems are perceived in their home place, how everyone you meet in Launceston has their story to tell about Charles, how he taught them (or, increasingly, their parents), how they would see him in the Co-op, or fixed his car, or knew his mother: and how everyone knows, it seems, how, when and where he wrote one or other particular poem, what spurred one specific piece of wit, who the pupil or teacher or shopkeeper or jolly hunter in one or another poem actually was. And where the mythical Eden Rock is situated, although Charles’ himself was purposefully vague allowing us to set our own ‘afterlife’ picnic scene in the river meadow of our own family album. Cahal Dallat’s residency was completed in July under the kind sponsorship of Literature Works. He continues to aid The Trust with the upcoming centenary celebrations. We have been delighted to sponsor Cahal’s residency and have enjoyed seeing his work progress over the summer. This post has been reproduced by kind permission of the Causley Trust.